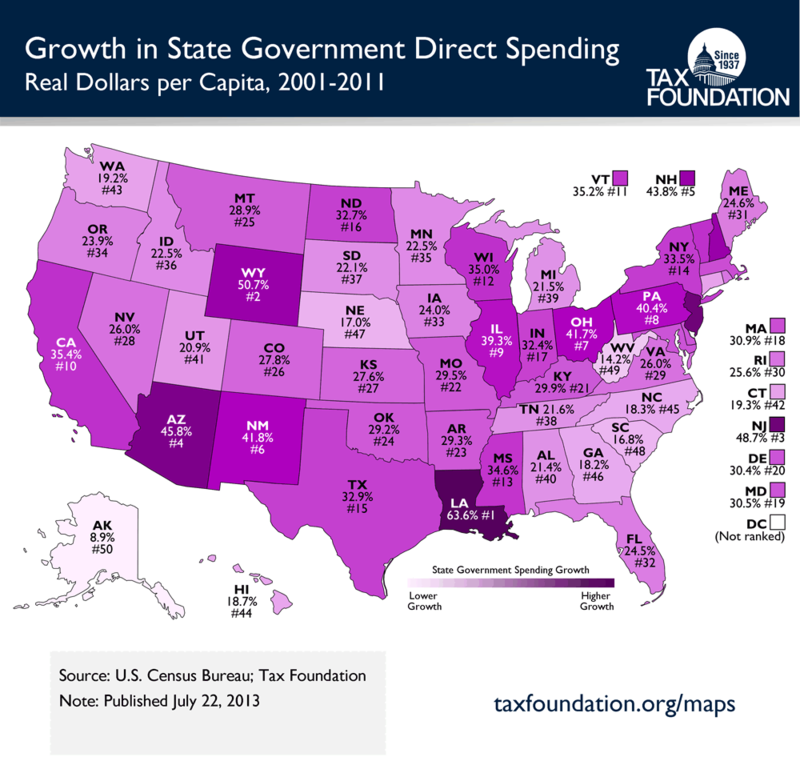 When Does Each State’s Debt Reach 90 Percent of GDP? Few economic studies have received as much attention as Carmen Reinhart and Kenneth Rogoff’s “Growth in a Time of Debt.” The attention is well-deserved. Reinhart and Rogoff have painstakingly assembled data on debt from over 40 countries covering 200 years, making it the largest dataset of its kind. They then examine the way debt impacts economic growth and find that as nations’ debt-to-GDP ratios go from 30 to 90 percent, their growth rates decline markedly. In the best case, their real average annual growth rates decline by about 1 percentage point; in the worst case, the growth rate is halved. To put this in perspective, if in 1975, the US growth rate had slowed by 1 percentage point, our current economy would be about 30 percent smaller than it actually is. And if our growth rate had been cut in half, then the current economy would be nearly 43 percent smaller than it actually is. In other words, an entire generation’s worth of economic growth would not have occurred. Absent policy change, the CBO is projected that federal debt held by the public will be 90 percent of GDP within 7 years. [S]tate government finances are not on a stable path; if spending patterns continue to follow those of recent decades, the ratio of state debt to output will increase without bound. Miron then calculates the year at which each state’s debt will exceed the fateful 90 percent mark identified by Reinhart and Rogoff. To help visualize Miron’s work, I have created a short YouTube video that shows the states whose debt levels exceed 90 percent of state GDP at certain time periods. Absent policy change, debt in every state of the union will be greater than 90 percent by 2070. But many of us don’t have to wait that long. In a number of states, the day of reckoning will come much sooner. Read Miron’s entire, informative, analysis here. This entry was posted in Tax and Budget and tagged CBO, Debt, economy, GDP, growth, Jeffrey Miron, Mercatus Center, percent, Read Miron, spending, union, US on September 16, 2011 by Matt Mitchell. What is the Best Way to Rein in Debt? Can We Learn From Others? The specter of a credit downgrade looms. But far more frightening is the cause of the potential downgrade: a debt-to-GDP ratio that will balloon to 90 percent within 7 years and 100 percent within 10. Other nations that have experienced that level of debt have seen their growth rates cut in half. Luckily, we are not flying blind. Others have wrestled with huge debt loads and some have made meaningful reforms. What’s more, these experiences have been exhaustively studied by economists and there is remarkable agreement about the most effective way to deal with a huge debt load. The experience of nearly two dozen developed economies suggests that the surest way for policy makers to rein in destructive deficits and stabilize the debt is to cut spending, not increase revenue. This entry was posted in Tax and Budget and tagged Debt, GDP, growth, spending on July 29, 2011 by Matt Mitchell. California Treasurer Bill Lockyear says the state may act quickly to obtain a bridge loan in order to pay for the $5 billion in revenue-anticipation notes (RANs) the state will sell in August. The reason for the quick action is the concern that a breakdown in federal debt limit talks might touch off a ripple effect in debt markets. If California doesn’t get its loan then it won’t be able to pay back the RANs and could be left with a budget shortfall at the end of the fiscal year. An interesting story of debt dependency to be sure. But are Mr. Lockyear’s fears of US default, based on the remarks of Fed Chair Ben Bernanke, misplaced? Veronique deRugy points out if the the debt ceiling isn’t raised by August 2nd this doesn’t mean the US will default. The Treasury can prioritize payments (e.g. pay interest on the debt first). Treasury Secretary Geithner has the authority to make those payments first. In addition Treasury can convert government debt into publicly-held debt. For more, watch Veronique on Bloomberg’s Reality Check. This entry was posted in Federalism, Public Finance, Tax and Budget and tagged California, Debt, Default, Fed Chair Ben Bernanke, Treasury Secretary Geithner, US on July 14, 2011 by Eileen Norcross. In October Central Falls, Rhode Island’s pension system will run dry. It’s the second town in the U.S. to face this scenario since Prichard, Alabama. The small town has a $80 million pension bill. Currently payouts represent one-quarter of the town’s budget. That will increase quickly once the fund runs out. As The New York Times reports Rhode Island’s municipal bankruptcy/pension dilemmas is unique. Rhode Island is a small state with 39 small municipalities. Thirty-six of these cities operate their own pension funds and 23 of these are considered “in distress.” The question now is: what is Rhode Island’s responsibility should these cities ask the state for help? Some place the blame on Rhode Island’s collective bargaining laws – set in state statute- that put everything on the table for negotiation. But then there is the problem of the pension plan itself, instituted by the local government in 1972. Consider also the role that accounting standards have played in underestimating liabilities. To date, Rhode Island has taken measures to reassure bondholders giving GO bonds priority over other forms of debt. It is unclear how this will play out and the extent to which Central Falls’ deep fiscal problems could trigger problems throughout the state. In addition to multiple independent local plans. The state operates its own Municipal Employee Retirement System in which several towns participate. The state-run plan is less than 36 percent funded with an unfunded liability of over $12 billion. This entry was posted in Pensions, Public Finance and tagged Central Falls, Debt, GO, Municipal Employee Retirement System, New York Times, pension, percent, Rhode Island on July 12, 2011 by Eileen Norcross.